Amid the endless sea of headlines generated by the ongoing government shutdown, thanks to President Trump’s insistence on holding the country hostage in the hopes of receiving funding for a border wall with Mexico, you may have already seen doomsayers promising that the shutdown will negatively impact your favorite small craft brewery. The beer-related shutdown stories have been flowing rapidly in the last week, due to the fact that one of the government agencies currently shut down is the Alcohol and Tobacco Tax and Trade Bureau, better known to brewers as simply the TTB. This federal agency handles the increasingly massive job of approving beer labels for the country’s more than 7,000 breweries—a task that has grown much more labyrinthine in the last five years as the number of breweries has skyrocketed. But now, with the TTB shut down, there’s a problem: No new beer labels can be approved. And if new labels can’t be approved, then new beer products can’t hit the shelves. Note, this doesn’t mean that breweries can’t sell their usual lineup of year-round or seasonal beers that already have labels approved. But if they brewed something new in the last month that is currently awaiting label approval? Well, that beer probably isn’t going anywhere (other than the taproom) for a while. This is problematic in particular for breweries depending on a steady flow of new releases to generate interest and hype—which is an increasing percentage of brewers these days. 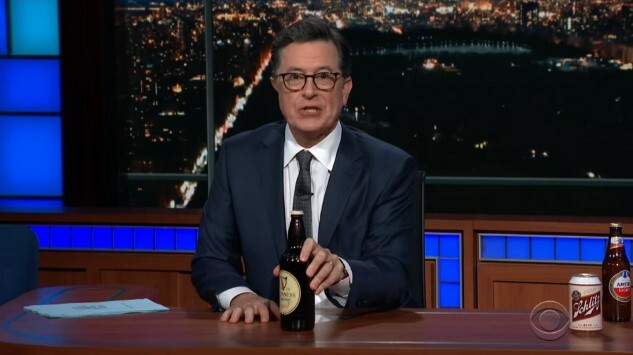 With that controversy in mind, Stephen Colbert took to The Late Show last night with a very amusing monologue on the state of beer in these Trump-challenged times. Using a bevy of readily available brews, he threaded the beers through his dialog, stopping only when he briefly knocked over a bottle of Yuengling, almost breaking it in the process. In fact, the wordplay amused me so much that I’ve copied it below, verbatim. Check it out, and check out the video below.